Do you need a cute little cabin for that camping spot in the woods? Would you like a hunting lodge where you can store your gear or warm up on those cold days? Our Timber Lodge may be the perfect option for you! Timber Lodge has the main entrance, two windows, and a 6’ porch across the end of the cabin. Add a rustic cedar railing to complete the picturesque front view of your snug little cabin. We build the Timber Lodge in a variety of sizes to accommodate all budgets and needs. Our smallest standard cabins start at 14’ x 24’ and go up to 16’ x 44’. The Timber Lodge includes a 16’ loft with stairs inside. We also construct the Double Deck Timber Lodge. The Double Deck has a door going from the loft onto a 6’ wide balcony. What better place to meditate and rejuvenate than this private little spot up and away from the hustle and bustle? Take your early morning cup of coffee out here and enjoy the blessings of nature! Schwartz’s Cabins gives you options that pay attention to detail. Would you like a screen door on your cabin to allow for air flow without permitting mosquitoes free entry? Would you like porch steps? Is your cabin positioned at a place where a walkway would make it more accessible? Gutters can keep the rain from pouring down your back when you need to make a dash for the car during a rainstorm. Are you interested in an interior door with a track? Would you like to consider laminated flooring? We also offer two types of insulation to keep your cabin cozy in the winter time. 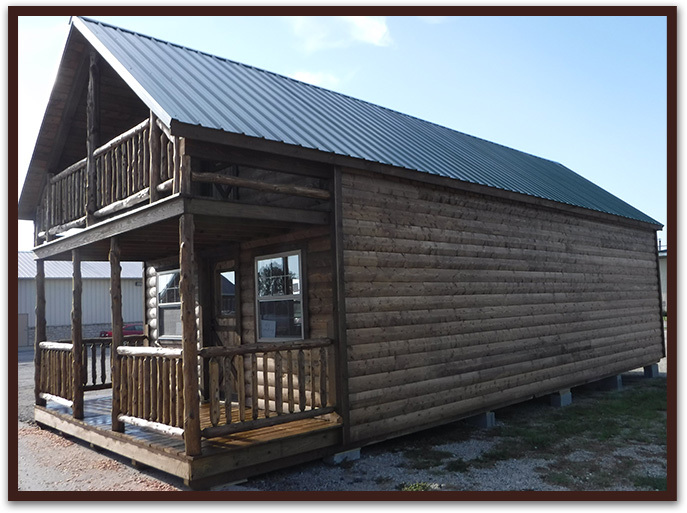 Our crew will be happy to discuss the pros and cons of these various options with you, building a quality log cabin that will meet your needs and look beautiful for years to come! If you have been looking for a well-built log cabin home for sale, you have come to the right place. Give us a call today at 606-301-3095. 8' x 10' mudroom - 80 sq. ft.
8' x 4' mudroom - 32 sq. ft.